2665 MILES AND FULL HISTORY!..CHEAP TO RUN, LOW CO2 EMISSIONS, £0 ROAD TAX AND EXCELLENT FUEL ECONOMY! GOOD SPECIFICATION ALLOY WHEELS, AIR CONDITIONING, AUXILIARY INPUT, PARKING SENSORS AND USB! ALL OF OUR VEHICLES MEET LARGE CITY EMISSION STANDARDS! 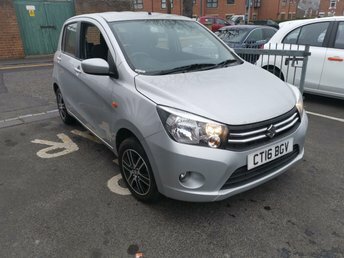 A city car that's good looking, has plenty of space on offer considering its size and class, and comes packed with equipment. The Suzuki Celerio is affordable to run and perfectly suited for life in the city thanks to its compact dimensions, economical nature and agile handling. Discover it from behind the wheel by arranging to test drive one of the used Suzuki Celerio models for sale in Chester Le Street at Bridge End Motors Ltd. All of our used cars are put through a thorough inspection process before going on sale so you can be sure of finding a quality car that's attractively priced. Contact a member of the team today for more information or simply begin your search here on the website.